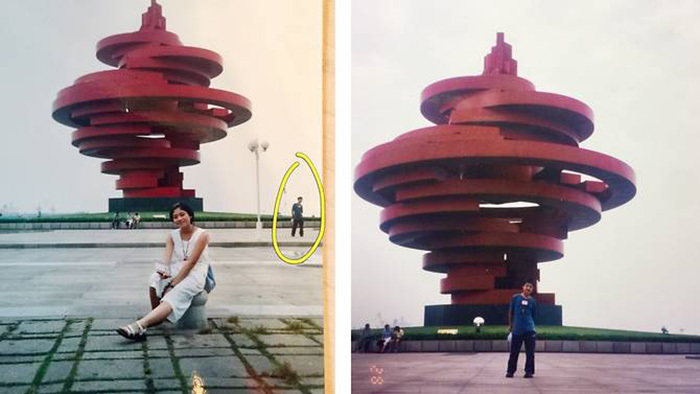 A married couple in China recently discovered that they had unknowingly crossed paths nearly two decades ago, thanks to an old photograph stashed away in a family album. Mr. Ye and Mrs. Xue met and fell in love in 2011 in Chengdu. But the two unknowingly crossed paths in 2000, when they both visited the seaside city of Qingdao at the same exact moment. Ye made the discovery last week while he was going through his wife’s photos from her younger days at his mother-in-law’s place to compare who their daughters resembled more. Xue had gone to Qingdao with her mother, who had just undergone an operation three months earlier and wanted to visit the city to relax. Ye was also at Qingdao, and was there only because his mother had suffered from appendicitis after booking the trip and asked him to go in her place instead. When Ye saw his wife’s photo, he instantly recognized himself in it. Ye shared the photos on a social media platform in China and the post went viral. China Daily reported that many of Ye’s friends commented on how the couple was meant for each other. According to Sina News, Ye now plans to bring his wife and two daughters back to the same spot.